There are many expenses involved with the operation of a vessel including manning, fueling, and insurance and maintenance costs. In order to have a profitable ship operation the revenue generated should exceed these expenses. In recent years all of these expenses have increased mainly due to the high oil prices. However, the cost projections for a specialized vessel such as a semi-submersible crane vessel (SSCV) are not similar to other conventional vessels. 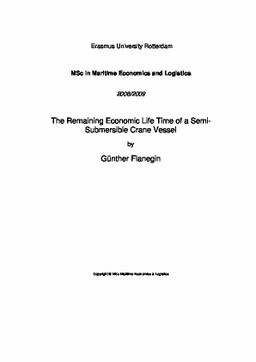 This thesis concerned the economical operation of a SSCV based on the technical state of the vessel. The current project at Heerema Marine Contractors entailed the development of a model that predicts when the vessel, from a technical stand point, no longer can generate the Economic Value Added (EVA) target desired by the company. With this tool the management can make strategic and operational decisions in the short and long term. Moreover, valuable information can be obtained to help managers make decision on maintenance, life time extensions programs, impact on investments of the economic an technical state of the vessels, and most importantly the optimum Cessation of Operation (COO). To develop this model a Life Cycle Cost (LCC) method was performed from the economic stand point of the vessel. First data was collected and graphed over a period of time in order to establish the variables and parameters for the model. The technical model was made by a combination of Life Cycle Engineering and safety assessment of the vessel. The LCC analysis was then forecasted over a period of time and used to make an operating profit model. The technical stand of the vessel should be in accordance with the classification society and HMC own standards. The classification societies have a specific standard that the vessel should meet in order to stay sea worthy. However, HMC wants its vessels to stay above this limit. As soon as the vessels technical state declined the company invests in replacements. Adding the operational expenses to the capital expenses over a period of time and keeping the specific technical state constant the economical performance of the vessel was obtained. The operating profit model was made very simple in order to support future expansion. The operating profit model illustrates how the profits decrease when the repair and maintenance (R&M) expenses increase for a fixed revenue. The core model can support future expansion such as the amount of days worked, which makes the revenue generated per vessel dynamic over time; therefore, a better prediction of the EVA target can be obtained. The same model can also support the fixed and variable costs, which are correlated with the amount of days worked. At last the operating profit model can be further modified to find the EVA target over time. The application of LCC to the offshore industry is relatively new resulting in various challenges giving rise to new ideas. The first challenge was to filter all the cost data available that leads to the maintenance of the vessel. The data collected should reflect the condition of the vessel. The major challenge was to link the economic model with the technical model in a logical and understandable manner. By linking the model to each other a better prediction of the earning capacity of the vessel was obtained. These challenges have inspired new ideas. Ideas such as a LCC database which keeps all the cost data associated with maintenance of a vessel according to the specification of the classification society separately. Furthermore, the technical model should be updated whenever repairs and replacements occur on the vessel in order to predict the exact condition of the vessel more accurately. HMC can use these data to control all the costs related with the vessel till its cessation of operation. The thesis research produced numerous conclusions and recommendations. For instance, it was found that the amount of working days correlated with the operational cost of maintenance. This finding is very logical considering the more the vessel works the more it deteriorates. From 2006 till 2008 the vessel Hermod had 1000 days in operation, during this period the repair and maintenance cost where sufficiently high to link the amount of days work to the expenses. The cost drivers associated with the vessel were also identified and for all the three vessels the engine room, the hull and the cranes were the major cost drivers. Furthermore, the cost patterns were deduced and the forecast was executed based on this observation. In the end, the model is able to give an indication of the operational profit of the vessel over an extended period of time. The EVA target for HMC can also be calculated using this model. The preliminary results indicate that only the Balder will have a good economical performance towards the end of its COO which is approximately in 2021. The model indicates that before the Hermod is put out of commission in 2016 it will be loosing money on maintenance and repairs. The Thialf will also perform economically poor before its COO in 2031. The main reason for the vessel Hermod to perform poorly around the operation year 2014 is that the repair and maintenance expenses increase in order to maintain the vessel above the required technical conditions appointed by HMC.